what a shame! violent forceful act by the police! – welcome! You are here: Home › Double standard › what a shame! violent forceful act by the police! such a shame!! look at how the speaker was so VIOLENTLY and FORCEFULLY removed! the police were like samseng, dragging him away. and they have no right at all to do so to the legal, lawful speaker out of his assembly sitting! and this picture from the nut graph. eeyeoww!! so absolutely shameful! 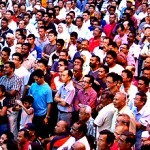 and do click on ‘read the rest of the entry’ for two more pictures from malaysiakini. 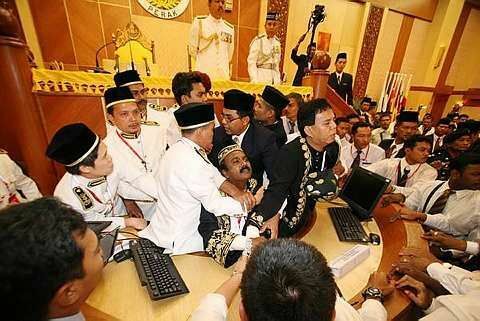 anyone who have or know of pictures showing the police abusing their power by acting like samseng, please let me know. i would like to have them all up here. such a shame!! look at how the speaker was so FORCEFULLY removed! the police were like samseng, dragging him away. the police made their point – they are on the side of barisan nasional (BN)!! it hasn’t been ascertained yet that sivakumar is not the speaker, and yet they force him out. sivakumar is the speaker and yet the police did not ‘obey’ him but instead ‘obey’ the BN people who order them (police) to remove sivakumar. blatantly show the police is on BN’s side! another thing is how come the police meddle in the assembly sitting? isn’t it that the legislative is independent? how come the police did not know the rules/constitution of the state assembly? The thing that people remember was the speaker being forcibly carried out. The photo showing the poor speaker being dragged out will be forever etched in the mind of millions. It was high-handedness at its most foulest. indeed! such high-handedness on the part of the police! looking at the photos made me so mad, so yes the images will forever etched in my mind. param cumaraswamy describe the removal as ‘in a crude manner’. lim guan eng decscribed it as ‘wild and extreme’. what other descriptions you guys hear of eh? like the photos, i would like to have them up here too. it’s so very shameful how the police acted. people of malaysia! let the whole world know of this! let the antics of barisan nasional (BN) be known to all! come the 13th general election, BN will be be-end!! see anil netto’s blog on this issue (he has many comments, so good to read the comments too). in another of anil’s post, he had pictures of these ‘strange’ men with white shirt and ties and an ‘officer’ tag. apparently someone heard some of them being called ‘colonel’ and ‘sergant’. so the conclusion people came to wat that these men are from the military. it must be these military men who forcibly removed sivakumar! 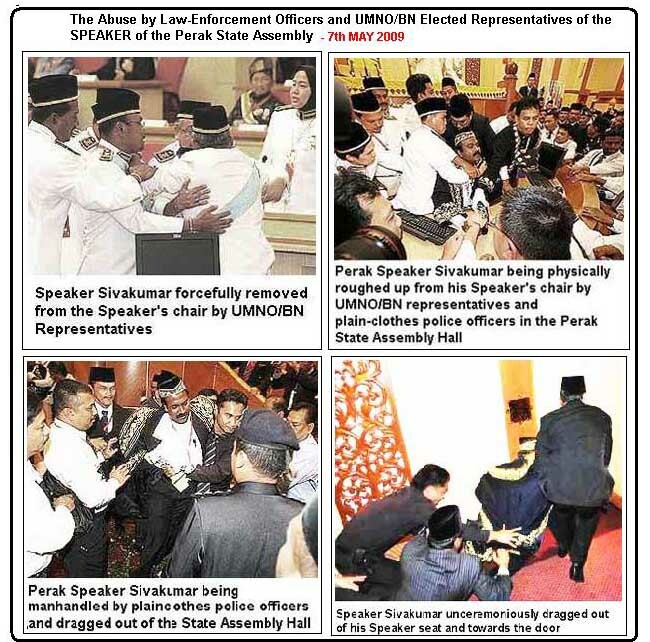 video of the ‘brutish’ removal also on malaysian unplug blog, with press statement from ngeh, who mentioned the police came from bukit aman, penang, kelantan, kedah, kuantan – meaning all these – the polcie barging in the assembly was planned by umno.